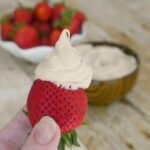 This low carb whipped mascarpone cream contains a splash of balsamic vinegar and pairs perfectly with fresh strawberries. 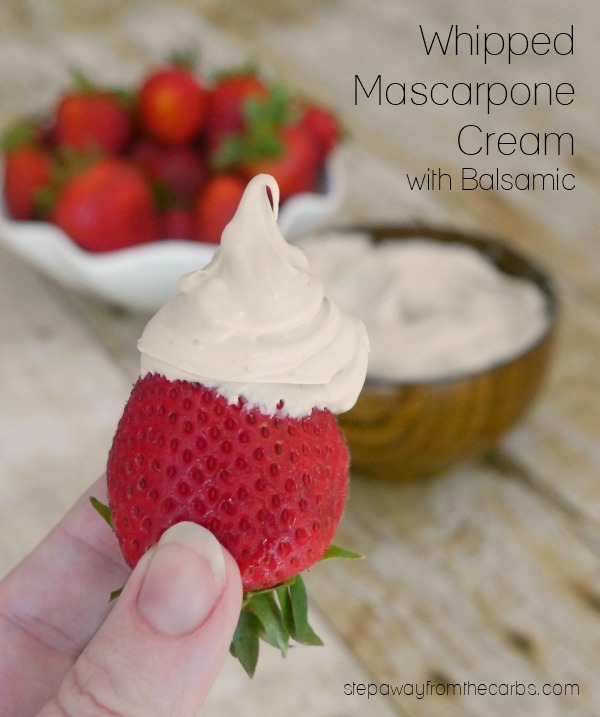 Unlike whipped cream, this whipped mascarpone can be prepared in advance which makes it a perfect dessert for dinner parties! In a stand mixer, add mascarpone, granulated low carb sweetener (eg xylitol or Swerve), heavy cream and balsamic vinegar. Balsamic vinegar is the one vinegar that actually contains carbohydrates, because of the sugar content, so usually it’s off limits. But for a special treat this combination of flavors is really worth a try! Beat the mixture until it is stiff. Transfer to a serving dish, cover in plastic wrap and store in the fridge until required. 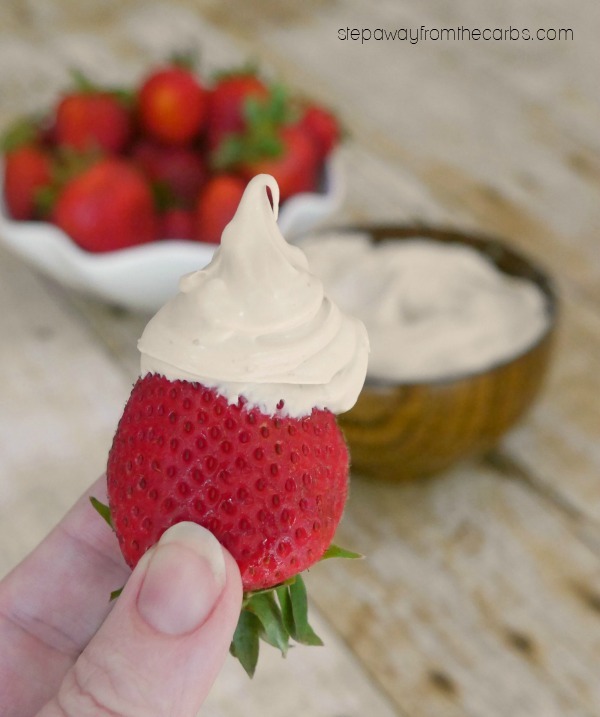 This flavored cream works really well with berries – particularly strawberries! You could either put one large serving dish in the middle for everyone to help themselves or provide individual portions. 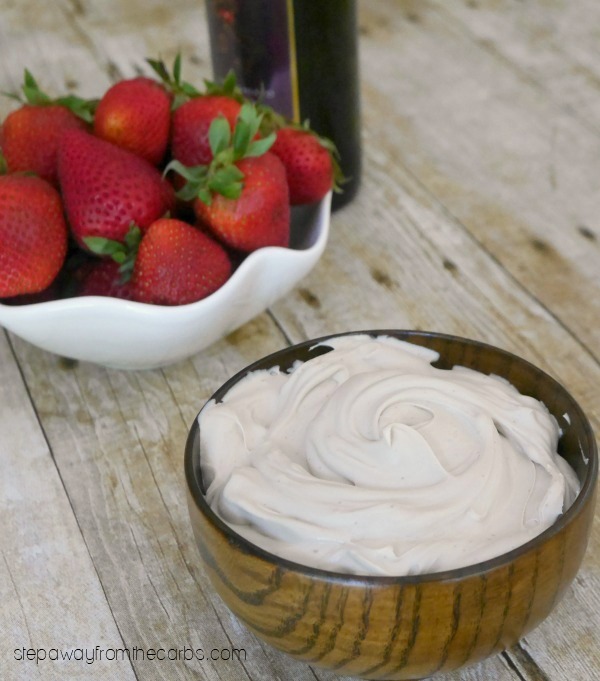 And in case you were wondering this whipped mascarpone doesn’t taste of vinegar at all – it has just a very interesting flavor that your guests will love! Add all ingredients to a stand mixer and beat until the cream is stiff. 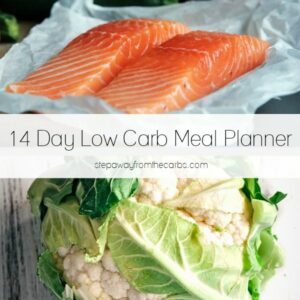 Spoon into a serving dish, cover, and refrigerate until required. 2g net carbs per serving (a quarter of the whole recipe). 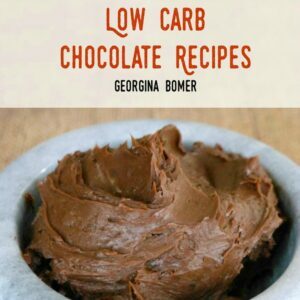 Adapted from Karen Barnaby’s Low Carb Gourmet. Really useful that you can make it in advance and it doesn’t collapse! Just mix it all up and eat it. 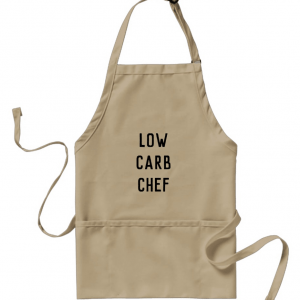 — Fold in, or serve with, some fresh or frozen low carb fruit (e.g. sliced strawberries, raspberries, etc. ).